Our goal was to develop an AC improver that could exceed the existing models of other brands and our own former E-Tuning… And we succeeded, convince yourself! Even a great power cable can be improved with our E-tuning Gold mk II. We have done extensive testing with power cables from Heavens Gate, Nordost, Chord, Audioquest, and… Akiko Audio. Time and time again an improved sound was clearly audible. The ‘ET’ mk II is filled with a mixture of minerals and piezoelectric and paramagnetic materials and enriched with gold. The E-Tuning Gold mkII contents are stabilized with black resin, a material which sufficiently suppresses microphony effects. This is an important condition for a calm and pleasant rendering of the music.This all works because we applied new discoveries in the field of high frequency noise suppression. That it works has also been demonstrated through measurements: suppressing high frequency noise leads to a more pleasant music rendering in the audio spectrum. • Connect it to the power cable of your amplifier, cd player or streamer. cable of your power conditioner. • Connect it inside the meter cupboard, near or to the power cable of your audio equipment. sensitive, you will be amazed at how the streaming signal can be improved by the E-Tuning Gold mkII. • Connect it to a NAS power cable, as close as possible to the device. They weigh 475 grams each, are 15 centimetres long and 5 centimetres in diameter. The new E-Tuning Gold mk II has a modern design of woven carbon. An ultra-strong material which doesn’t only contribute to its working, but also looks great. What can you expect? A more natural rendering of instruments, less sharp voices and an increase in spaciousness. 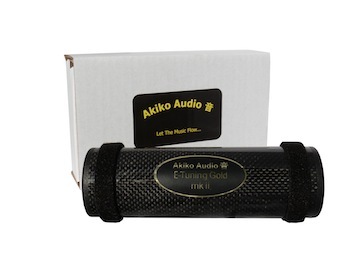 More warmth…And again Akiko Audio’s assurance: if you aren’t satisfied, you’ll get a full refund.